Having taught a variety of things so far in my life, from Elementary Spanish to Taekwondo, it was a natural step for me, after beginning my journey with yoga in 2005, to transition from practicing into teaching. 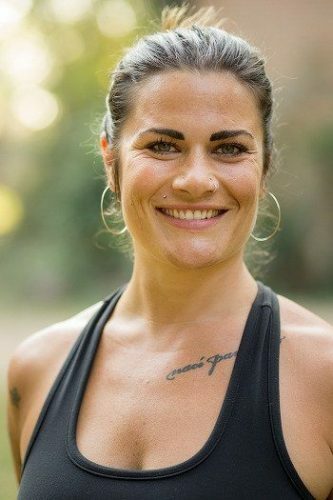 Also and avid dancer and sports practitioner, I love the way that yoga allows me to blend my love of movement and athleticism with mindfulness to make it a truly conscious experience. Partner Acrobatics and Flying Therapeutics also embody these qualities in an undeniable way and it is so much fun! I was instantly intrigued and drawn into the partner acrobatics practice from my first introduction during a Yoga Therapy Training I was participating in while in India. One of the other women in my course had taken an AcroYoga immersion and was flying one of our other class mates one afternoon on a break. I simply HAD to learn this new modality. Amazingly enough, the first Partner Acrobatics Teacher Training was being held the next month, right down the beach from where I was staying. It was an easy decision. I love the Yin and Yang components of the Acrobatics and the Flying Therapeutics practices. Elements of touch, connection, trust, release, and mindfulness are truly present in both. With the acrobatics practice, I encourage students to face fears or challenges with a smile on their faces, remembering that we have friends supporting us and willing to help us through. To stay mindful in their movements and to use connection to enhance their personal practice. It’s not so much about “getting” the move(s). I had done my first Thai massage certification a couple of years earlier and was amazed by the way the Flying Therapeutics took this off the ground and elevated it. The way time, gravity, and patience have the ability to provide a weightless and timeless experience for the receiver is unlike any other modality I had ever tried. In addition to the Partner Acrobatics/Flying Therapeutics Training I have also completed a 200-hr Power Vinyasa Teacher Training, a 500-hr Chakra Teacher Training, additional Power Vinyasa training, Yin, HoopYogini™, Elemental Yoga Therapy, and Reiki trainings. I have gone on to assist trainings internationally and offer my own unique retreats. I thanks my many teachers and draws from all I have learned to encourage students to discover their inner strength and power while tailoring a personal practice to complement their individual needs and abilities. I am dedicated to making yoga accessible, fulfilling, fun and joyful for all those who attend my classes and aim to guide students to find how yoga can enrich their lives and unlock the divine potential in us all. I’m thrilled to be invited to assist the PA team in sharing this practice on future trainings!